Many people approach their food plan for self-support kayak trips the same way they’d approach a backpacking trip — keep things simple and light. There’s a time and a place for that kind of food menu, but on most trips, kayakers can afford a bit of luxury. This article will talk about the considerations to think about when planning and how they impact what you can bring, and will give some examples of how I plan for longer trips. This one is pretty obvious, but if you’re going to be lugging your boat around huge rapids, weight is an issue. Same goes for hikes in or out. That said, one portage doesn’t mean you need to eat Mountain House for every meal — it’s a spectrum. Even on challenging trips with a lot of portaging, I’ll bring some fresh food to supplement dehydrated meals. But on a trip like the Grand Canyon where I know the furthest I’ll be carrying my boat is 10′ up the beach at the end of each day, I really let myself go. Think about where your trip falls on the boat-carrying spectrum and plan accordingly. 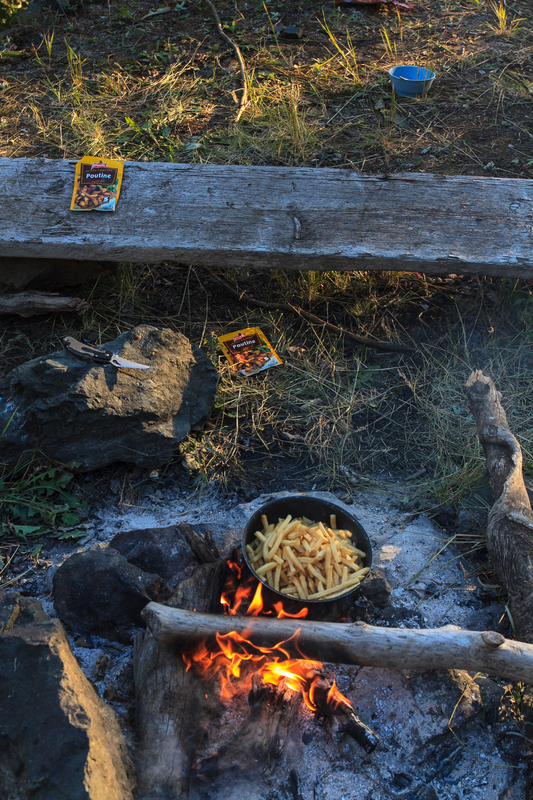 Poutine on the Stikine: people have different opinions on how much weight is worth carrying, even on hard rivers with plenty of portaging. How Warm Are the Air Temps? How Warm is the Water? We normally refrigerate meat and vegetables at home, so how can we bring that stuff on the river? Well, the reality is that most pre-cooked sausages and fresh vegetables will last for at least a few days in your boat as long as they’re not sweltering in the sun. On a winter Grand trip, you can push it because water temperatures are consistently around 42F, air temps aren’t too high, and sun exposure is limited. I’m usually able to eat fresh vegetables through all 10 days of a Grand Canyon trip, and I’ve had meat last through the end of a trip as well. 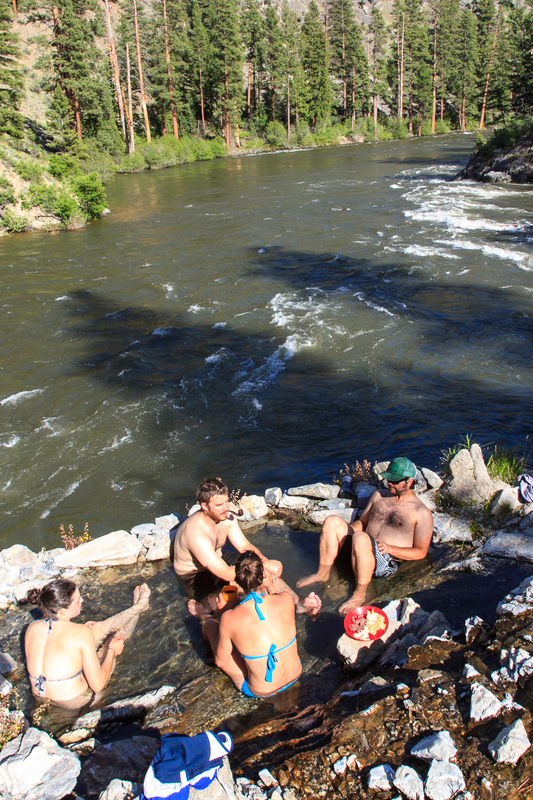 Of course, if you’re self-supporting Hell’s Canyon of the Snake in July, you’ll need to be a lot more wary about foods that can spoil. 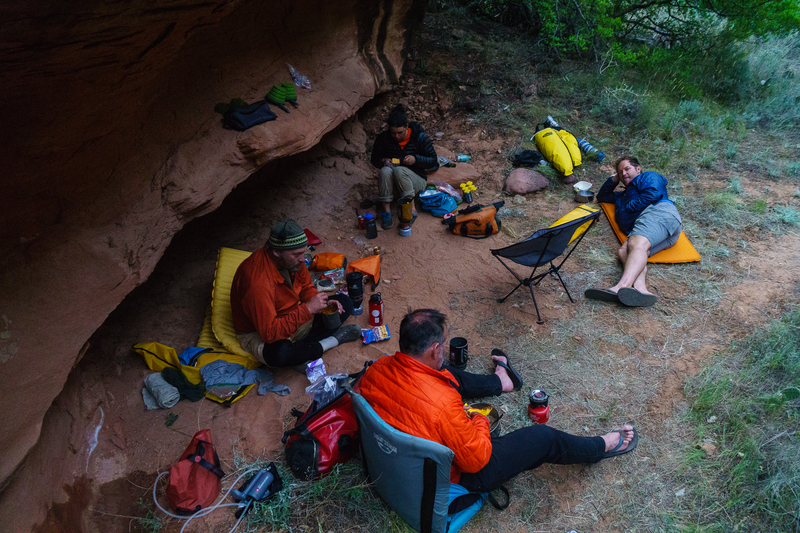 A little of each strategy on a marathon trip down the Dolores River. If your trip is really long, you may want to do fresh food for the first few days and transition to mostly dehydrated by the end. At the very least, you’ll need to think about how your food planning needs to change over the course of the trip. You might bring a heavy meal (like a steak!) for the first or second night, and have lighter food later in the trip. I’m all for good cooking on self-supports, but there are a few reasons to consider meal complexity while you’re planning. First off, particularly with breakfasts, you want everyone in the group to be on the same page. If four people are eating oatmeal and the fifth is making pancakes, that fifth person better get up early or the rest of the group won’t be very happy. 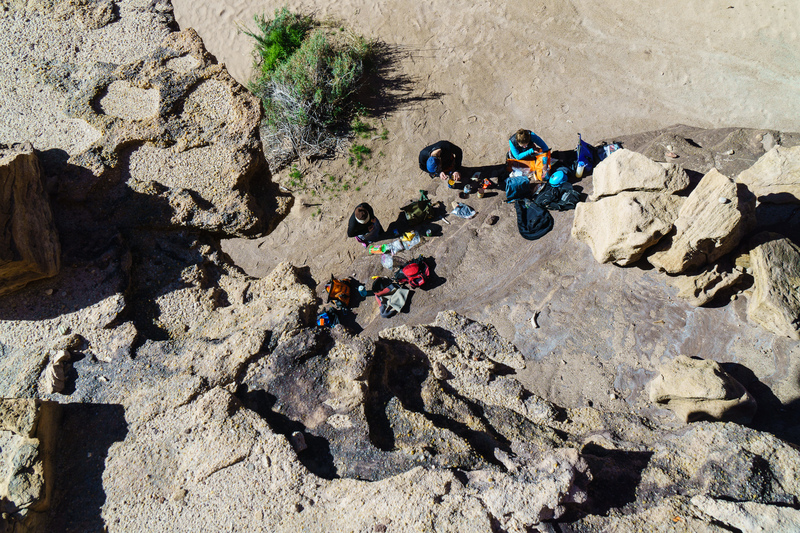 Second, you might think a picture of a four-course meal on a beach in the Grand Canyon will make for a killer Instagram post when you’re sitting around at home…but actually cooking it when it’s dark and you’re tired, hungry, and cold is another story. Oatmeal is the gold standard here. Backpackers, kayakers, anyone who wants to travel relatively light eats instant oatmeal for breakfast. I don’t really like oatmeal, personally, but I recognize its utility and frequently use it. That said, I’ve done Grand Canyon kayak trips with bacon and eggs for every breakfast. It’s nice, but you generally have to get moving pretty quick to keep up with the rest of the group. I like a balance that involves eggs some days, oatmeal other days. The simple option here is basically to just snack for lunch. Salami, cheese, carrots, hummus. Add in some bagels if you want to make sandwiches. That works great — easy to keep in a day-accessible pack, calorie-dense, fast. That said, especially on winter trips, the Hot Lunch can be a pro move. The traditional Hot Lunch method is to pre-make hot soup in the morning and keep it in a thermos. You just whip it out at the lunch stop and you’re in business. On a trip last year, I was introduced to another method, which is to use a small Jetboil-style stove to actually make ramen (plus tuna, or whatever else) at lunch. It sounds like a lot of work, but if you’re efficiently packed, it works really well, and a small stove is generally no bigger than a thermos. Jackie Selevan and Seth Swallen crushing the Hot Lunch game with some spicy thai ramen and tuna. Nothing says pro like whipping out a bag of fine wine and a plate of charcuterie while everyone is setting up camp. I’m a huge fan of the pre-dinner snack and everyone will love it if you’re willing to share. A plate of meat and cheese or veggies and hummus goes a long way for comfort without costing very much room, especially if your day on the water ends a couple hours before you might want to cook dinner. Pro-lifestyler Jo Kemper teaching the rest of us the ways of the apéritif with some charcuterie on a Middle Fork Salmon self-support trip. There’s a lot of freedom with dinner. For the most part, I just cook the same things I cook at home. But if you’re trying to minimize work or go somewhat light, there are a few tips and tricks I like. Backpackers’ dehydrated meals are a fine option, but generally expensive and a bit low on calories. I often go for some of the other dehydrated or at least vacuum-packed easy meals you can find at grocery stores. Things like Uncle Ben’s or other brand’s rice sides, couscous boxes, and dehydrated veggies and beans from the bulk section are far cheaper and every bit as easy. Packaged meals like TastyBites are delicious and much cheaper than Mountain House or comparable. They’re heavier because they’re not freeze-dried, but they’re not bulkier, so for most kayak trips, they’re good to go. Even if you’re going full-on dehydrated, I like to throw in some fresh vegetables to keep things interesting. Bring an onion and shave a bit off for each meal or snack on some carrots as an appetizer. The last thing you want to do is accidentally forget a critical ingredient (or a whole meal! ), so it’s important to be organized before the trip. For longer trips, I use a spreadsheet and plan each meal as a row. If you list ingredients as columns, you can sum them all at the bottom of the sheet and compile the totals into a shopping list. This Google sheet contains our food plan for two different 10-day kayak trips down the Grand Canyon. Note: this meal plan is for two people. On these trips, we went pretty heavy. I brought a cast-iron skillet and we cooked most dinners over the fire. Check out the No Coolers cookbooks at nocoolers.com!